At his recent event at the Edinburgh Book Festival, Andrew Crumey pointed out that there were two types of mystery novels. In one the puzzle was like a jigsaw, satisfyingly pieced together until complete but then rather redundant; in the other the puzzle is never entirely solved and those looking for a solution will only experience frustration, as if the jigsaw had a number of pieces missing, or pieces from other jigsaws had infiltrated the box. 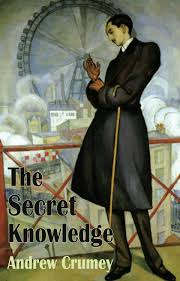 Suffice to say that Crumey’s work is much like the latter: those coming to The Secret Knowledge expecting that secret to be unveiled by the end are in for a disappointment. Those, however, looking to be stimulated and challenged may want to open the box. Pierre says he has one final test for her: “Wait here and when I come back our future can begin.” A few minutes later he shoots himself. In the second narrative, David Conroy is a pianist on a downward spiral. Once tipped for greatness, he is now only rarely invited to perform and spends most of his time (when not feeling sorry for himself) teaching. Through a chance meeting (though the novel throws into question the very concept of chance) he comes into possession of Klauer’s symphony and passes it on to a new student, Paige. You are currently browsing the archives for the Andrew Crumey category.